← Why was Gandalf in Lord of the Rings yet not in Star Wars? There are already several commercial companies to send tourists on space flights into the upper atmosphere or Low Earth Orbit (LEO). 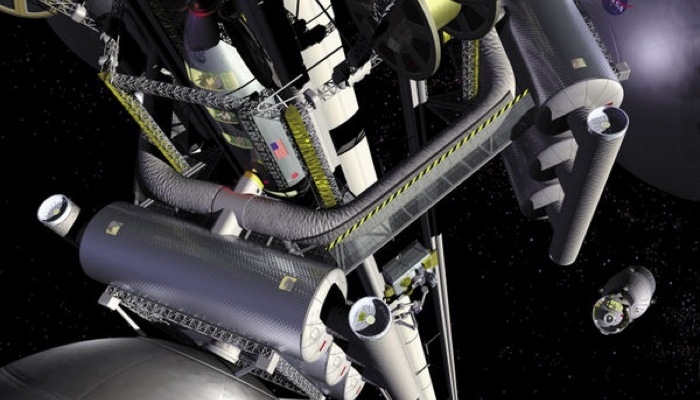 It is a small step from there to an orbital station for short stay or even weekend trips. Once the infrastructure of this kind of space holiday is in place, it will become cheaper to provide and so attract larger numbers of visitors. The stations will expand, and for convenience, staff will be hired to work in space for long periods. Travel will become not only possible, but necessary as the volume of migrants forces the larger stations out of orbit. Longer term visitors will become the norm for some large-grade ships, and all of these inhabitants will want their home comforts like entertainment and leisure facilities. The colonies will be like big metal planets, keeping the inhabitants in the manner they were used to on Earth. But where do the resources come from? For a while the space program offers a much-needed boost to wounded economies, using the wealth of the elite to fund space travel flights providing jobs for the poor. As the demand grows, so do the opportunities for engineers, builders, miners, administrative work and many more, right down to lowly cleaners. Business booms, and society is happy. As the colonies grow off-planet, however, so do their needs. They become parasites, leeching what they cannot produce. The wealthy pay to live in space and the unfortunate souls left behind become no more than slave ants to the Queen, throwing all they produce into the sky. The planet, already ravaged while humans supposedly took care of it, becomes a second-class hovel. Hatred brews, and a great schism hits mankind. It’s them and us. The Earthlings, sick of being second-best, refuse to bleed themselves dry any longer. The sky-dwellers are forced to scavenge the solar system for resources or return home and risk a lynch-mob. After all, what do they have to offer for what they need? These big metal planet colonies are like the Mad Max of space, fighting and stealing for what they can get. Society breaks down, lawlessness is rampant and some even resort to cannibalism. In short, living in space might look very pretty on Star Trek but it probably isn’t going to be quite that glamorous. Posted by DaniBiscuit on April 10, 2010 in How?, What?